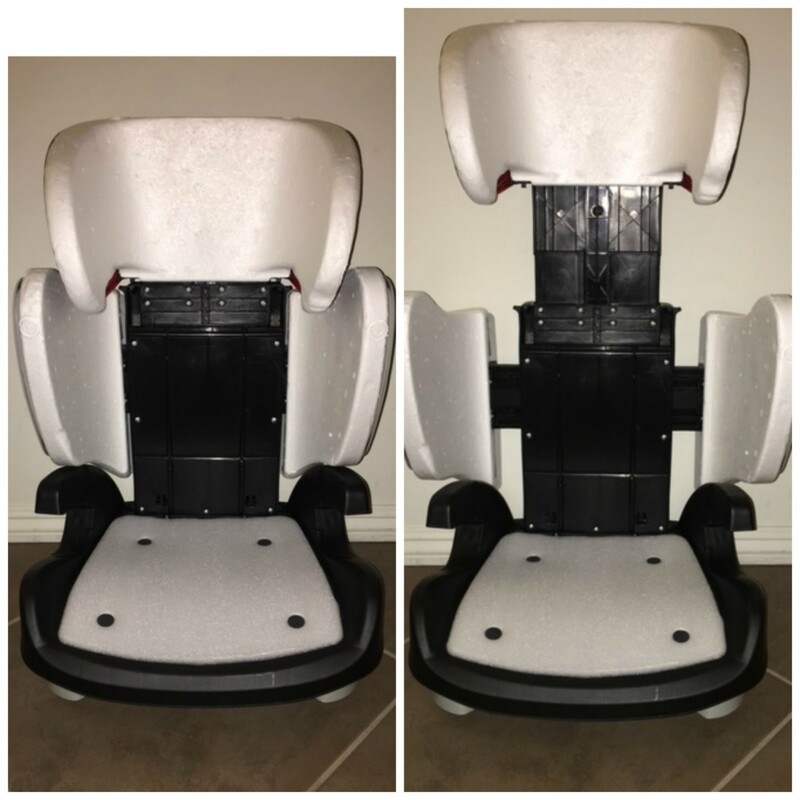 Home » Reviews » Aidia Pathfinder High Back Booster & Scout Backless Booster Review! 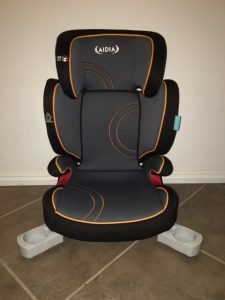 Aidia Pathfinder High Back Booster & Scout Backless Booster Review! 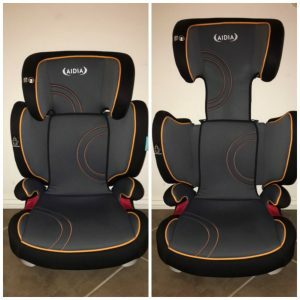 As a mom to a 4 year old and almost 2 year old, I have spent quite a lot more time with my hands on convertible car seats than boosters, so I jumped at the chance to check out new boosters from a company near my home. 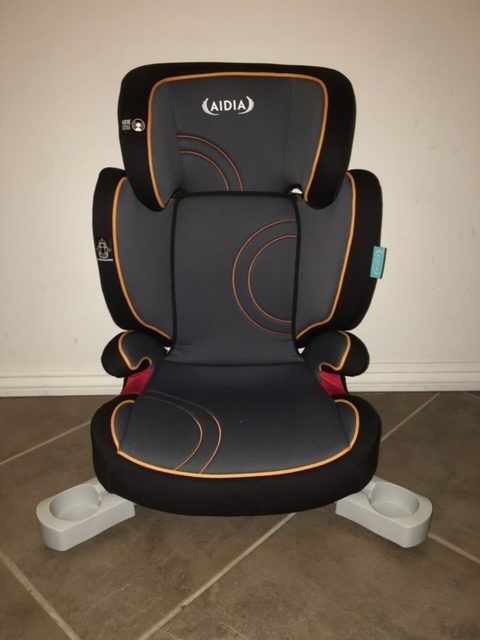 Aidia, is an up and coming company that makes booster seats, and pretty darn good ones at that. They have a few different high back models and a backless booster, and for this review we’ll look at one of each category. First up is the Aidia Pathfinder Belt Positioning Booster. 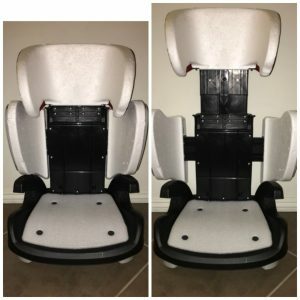 It is a highback booster that not only has an adjustable headrest, but is unique in that the width of the side wings also expands as the headrest is moved. 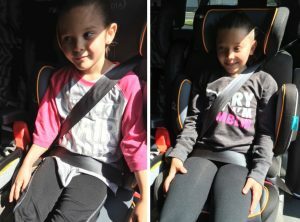 It gives bigger kids more space so they can comfortably use the Pathfinder until they transition to a backless booster or until they pass the 5 Step-Test and can safely use just the adult seat belt. The Pathfinder is just a highback booster – it cannot be used without the back. The second seat, the Aidia Scout Backless Booster, is a narrow backless booster that can fit into tight spots, but doesn’t sacrifice quality or comfort. Both the Pathfinder and the Scout are available at Amazon and on Aidia’s website. -Not one, but two(!) cupholders that are integrated into the seat and can be completely stowed when there is a space constraint. We thought these were great because they were so non-intrusive when stowed to fit 3-across in our minivan, but in a situation where you have more space, they’re available for use. 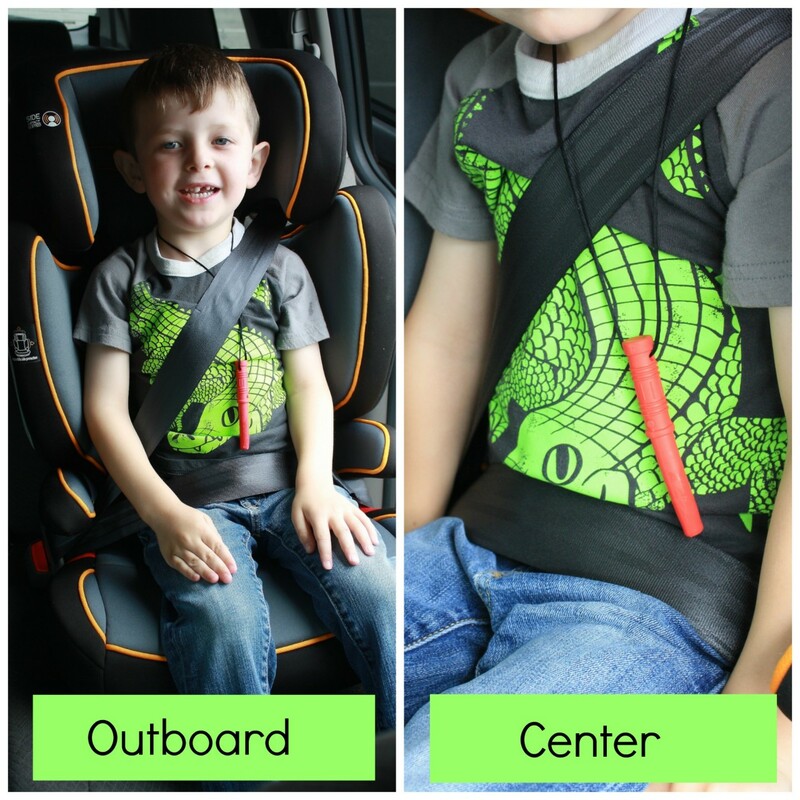 -Shoulder belt guide was designed in an S shape so it traps the buckle and doesn’t let it slip out, but it doesn’t trap extra slack in the seat belt, as can be the case with some high back boosters. -7 headrest positions: lowest 13.25”, tallest 18” measured from seat to the bottom of the shoulder belt guide. 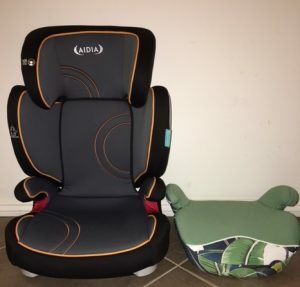 As with all car seats, it is important to make sure that you have the seat adjusted to the proper height for the child you’re working with. 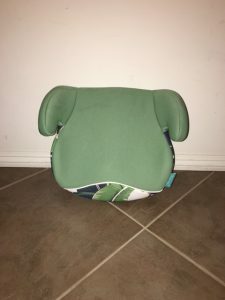 In this case, for proper fit the headrest should be adjusted so that the shoulder belt guide is situated “at” or slightly above the child’s shoulder. For my models, the belt fit was great for older kids and a little hit and miss for younger. My 4 year old, who has never sat in a booster (and is years away from being ready to do so in a moving vehicle), is very petite at 39.5” and 34 pounds, but still meets all the physiological criteria to use this seat. In all seating positions, the shoulder belt hit in the middle of his collarbone and laid flat without issue, which was great. In the outboard seat of my Odyssey, the lap belt fit was a little higher than I was comfortable with, and I probably would not have let him ride in that seat as a result, though it was very close to passable (of course, it was easier to see this in person). In the middle seat, the lap belt fit was better, though still on the borderline of acceptable. I think this has to do with where the belt attaches and the angle it travels to the buckle. It was hard to capture it in photos, but here’s a comparison of where the lap portion hit in the two seating positions. 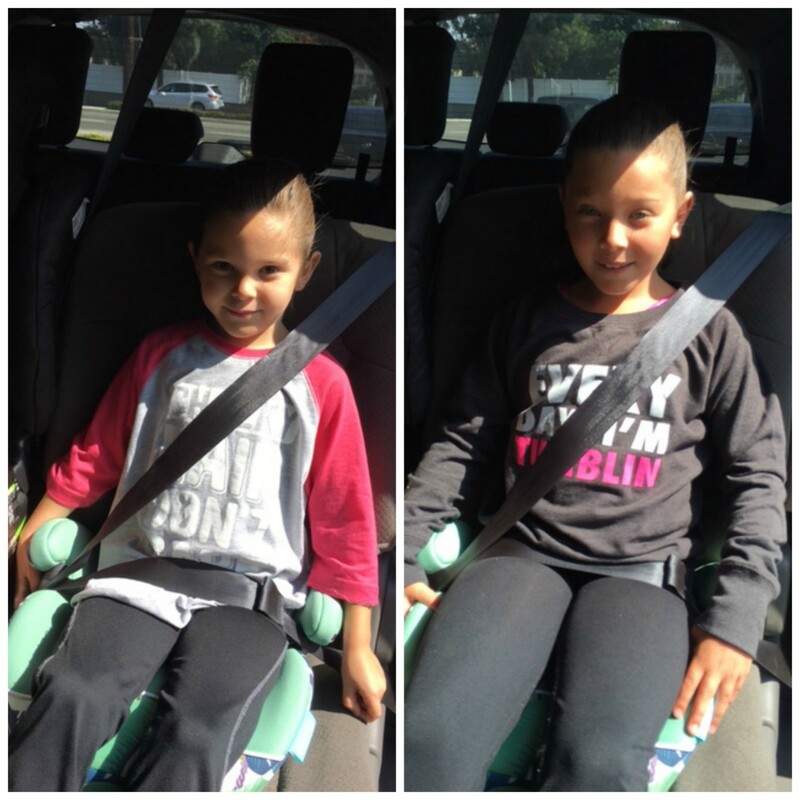 My older models, ages 6 (44″, 45 pounds) and 8 (50″ and 60 pounds), got a great belt fit in all seating positions in my car. My older niece commented that she thought the Pathfinder booster was “super comfortable” and she felt like she could sleep in it while in the car, which is a frequent issue for on long road trips. A ringing endorsement for sure. I don’t have a model at the upper end of the height/weight spectrum at my disposal, but there was plenty of growing room, especially in height, for older, bigger kids. The Pathfinder high back booster is relatively narrow at the bottom, but as you can imagine, as the side wings expand, they take up more and more room, making it a bit of a challenge for puzzling 3 seats across. 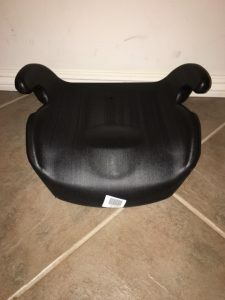 With the headrest in the lowest setting, it fit well between a Peg convertible and Britax Frontier in the 2nd row of my Honda Odyssey, but once the headrest was extended, there wasn’t enough room side-to-side. It fit better outboard than in the center and would work in that position for a 3-across if needed. Buckling in was definitely a challenge, but far from impossible and would probably improve with time and practice. I attempted to fit the Pathfinder in the center seat of our Honda Fit between two Clek convertibles but it didn’t even come close to fitting. This doesn’t really say much about the seat since that backseat is basically miniature, but know that it does not make a particularly narrow booster in very tight spaces. The fabric is high quality and well padded. It is easier to remove than I expected, with hooks holding most of it in place. The cover can be machine washed on cold and left to air dry, as machine drying may cause it to shrink. 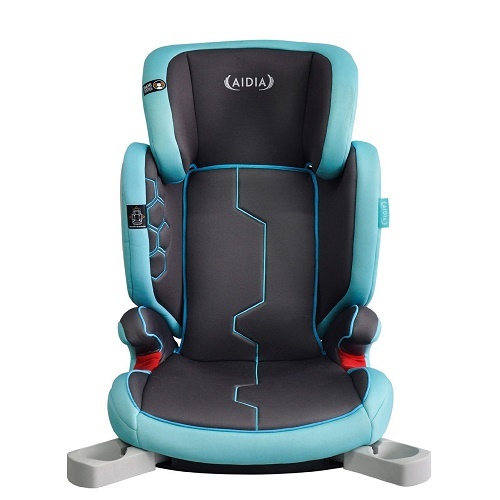 The seat itself has patented TriPad™ technology, which consists of 3 foam layers that provide more comfort for the little bodies that sit in the seats. My boney little guy said that his big seat (which he did not get to take an actual ride in because he is no where near mature enough to sit upright for a full ride) was the most comfortable seat he’d ever sat in. He tends to be a bit of an exaggerator, but he’s also pretty good at whining when uncomfortable, so this was a ringing endorsement. -Narrow enough to fit in some 3-across situations. 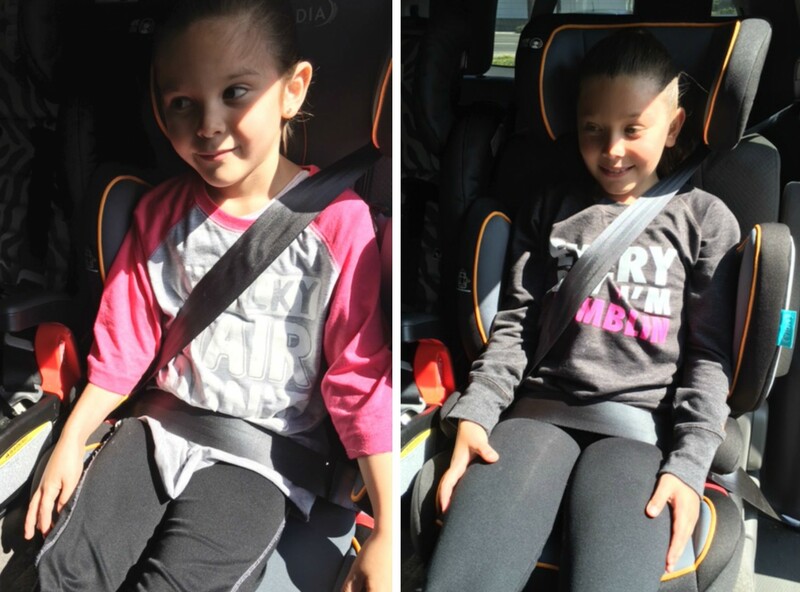 -Headrest adjustment also widens side wings for bigger kids. -Well padded with fashionable, washable covers. -Shoulder belt guide captures the belt well, preventing it from slipping out without introducing extra slack into the system. -Support from vehicle headrest is not required. -Adjustable side-wings significantly increase the width of the seat. -The manual storage on the bottom of the seat is kind of worthless- my manual fell out after about 15 seconds. -The lap belt fit is barely passable on smaller kids in some seat belt set ups. -For children 40-110 pounds; 40-57 inches tall; no age is listed in the manual or website, 4 years old was recommended on the box. -Comes with an attached, but stowed, shoulder belt guide, for use if needed for improved shoulder belt fit. 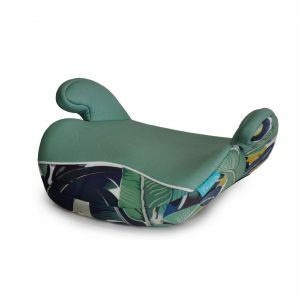 -The Scout is a solid seat that while not as light as some others, is sturdy and structurally sound. My 4 year old was not tall or heavy enough for this seat, so I relied on my nieces who are 6 and 8 years old, to see the fit-to-child. Both of them had great belt fit, without using the shoulder belt guide, in the outboard seat in my car. I suspect in a vehicle where the belt was coming from the ceiling or is farther forward, you might need the shoulder belt guide to improve the belt fit, but it was easy to unhook from it’s storage strap and attach to the seatbelt (just above shoulder level, per the manual) if needed. The lap belt sat low on the thighs and the armrests were deep enough to hold the belt very securely. The Scout is super narrow and fit easily in multiple different 3 across situations. The shape of the seat made buckling possible, but not especially easy in 3 across situations in smaller back seats. The fit to vehicle was about as excellent as any backless booster on the market. The covers are nicely plush and pretty thick on their own. They are machine washable on cold, and hang dry to prevent shrinking. I will say that while the color I chose was eye catching, it did also seem to attract a lot of dirt. Literally people sat in this seat for mere moments and then it sat in my back seat and there are visible stains. Thankfully removing it for washing is a breeze. -6 year lifespan from manufacture. -One of the biggest advantages of the Scout is its width. It’s extremely narrow and fits well in 3 across situations. -Comes with an attached shoulder belt guide that can be used to improve the shoulder belt fit. -The fabric selections are really pretty. I know this sounds kind of silly, but when you’re trying to get bigger kids to buy into riding in a booster, the cover selection matters. -Not very wide for bigger kids. -The lighter color fabric shows dirt easily. -Like the Pathfinder, the manual storage slot does not actually hold the manual. Booster seats are a unique class unto themselves because they hold bigger kids with bigger opinions. They need to be padded enough to be comfortable and adjustable for a variety of sizes and the Pathfinder especially fits this bill extremely well. 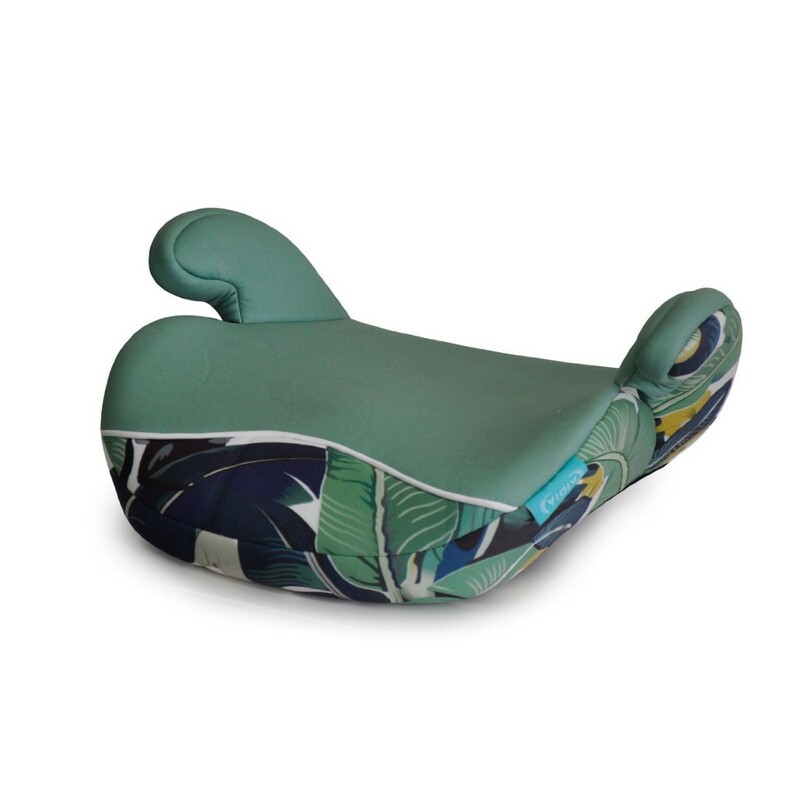 The ability for the side wings to expand is a great innovation that will allow this booster to last a child from when they begin riding in one (ideally, not until at least age 5-6!) until they can “5-Step” in all vehicles. The integrated cupholders are also an amazing, versatile asset to the Pathfinder that cannot be overlooked. Additionally, the Scout backless booster excels as a narrow option for a 3 across situation and the fabric is unique and bright enough for even older kids to enjoy. The price point on both the Pathfinder and the Scout are very reasonable for the quality that you are buying. Though these both fit children from 30 or 40 pounds, and 39 or 40”, doesn’t necessarily mean that kids that fit in those ranges are developmentally ready. Make sure that your child is mature enough to sit upright through an entire ride so that they can take advantage of the excellent belt fit they’ll get with each of these boosters. Thank you to Aidia for providing the Pathfinder and Scout samples for this review. No compensation was provided and the opinions and comments are exclusively those of CarseatBlog. For more info, please see the Aidia website. Is the highest headrest height really 18 inches? If accurate, I would say that is a huge con to the high back seat. Turboboosters are considered on the short side and they’ve got about an inch or so more height.